17-3421 120/70ZR17 A Soft 17-3422 120/70R17 VA Soft 17-3423 120/70R17 VB Medium/Soft VA &VB front tires have pointed GP Casing for greater ﬂick ability. 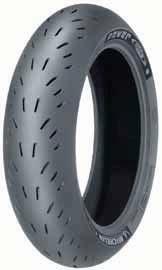 New ultrahigh performance Power Cup DOT racing tires designed and engineered for track use. For use on public roads cold inﬂation pressure use OEM handbook settings. Power Cup dimensions same as Power SuperSport. 30 psi front and 27 psi rear for track use. For use on public roads cold inﬂation pressure use OEM handbook settings.